Part one featuring the imports of Blackwater, Kia and Barako Bull can be read here. Part two with the imports of NLEX, GlobalPort and Purefoods can be found here. For the third installment of SLAM PH’s Commissioner’s Cup import profiles, we now take a look at returnees Richard Howell of Talk ‘N Text and Barangay Ginebra’s Michael Dunigan, as well as neophyte Rick Jackson of Rain or Shine. Although he was bestowed with the Best Import Award in last year’s edition of the Commissioner Cup, it was not a pleasant ending to Richard Howell’s maiden stint in the PBA as the Tropang Texters were drubbed in the Finals at the hands of San Mig Coffee, after breezing through the eliminations and semifinal round unscathed in 13 games. Giving the Talk ‘N Text frontcourt a shot in the arm at 6’8” and 250 lbs., Howell averaged a double-double of 19.2 markers and 18.6 rebounds in his first PBA conference a season ago. A teammate of Globalport’s C.J. Leslie at North Carolina State, Howell played four years of collegiate ball. In his senior season in 2012-13 wherein he was named to the Atlantic Coast Conference’s (ACC) First Team, Howell tallied 12.7 ppg, hauled down 10.9 boards, dished 1.7 assists and stole the ball once per ballgame for the Wolfpack. Passed on by teams in the 2013 NBA Draft, Howell became part of the Denver Nuggets squad in the 2013 NBA Summer League as well as that of the Portland Trailblazers’ preseason roster. He also suited up for the Idaho Stampede in the NBA D-League. Before his return to the Tropang Texters, Howell balled in the Italian league for Juvecaserta Basket. Arguably having the PBA’s tallest frontcourt with Greg Slaughter, Japeth Aguilar and Jay-R Reyes in tow, Barangay Ginebra added yet another skyscraper to their towering lineup by acquiring the services of former Oregon Duck and Air21 Express reinforcement Michael Dunigan. Marking his return to the PBA after debuting for the Express two seasons ago, Dunigan gives the Gin Kings a versatile inside presence on offense and defense. Given Dunigan’s defensive acumen, expect other members of the Gin Kings frontline such as Slaughter and Aguilar to concentrate more on scoring buckets on the other end, especially now that they have returned to the run-and-gun system of play. In the 15 games that he saw action in during the 2013 Commissioner’s Cup under Air21, the 6’8” Dunigan tallied 23.9 markers, 15.4 rebounds, 3.3 assists and 2.4 blocks per contest, to tow the Express into the quarterfinals as the No. 8 seed. These figures not only made Dunigan a strong contender for the Best Import plum that was eventually won by Alaska’s Robert Dozier Jr., but also made the Gilas Pilipinas program consider him as a prospect for naturalization back then, along with San Mig Coffee’s Denzel Bowles. After a two-year varsity career with the University of Oregon in which he averaged 8.7 points, 4.8 rebounds and 1.14 blocks per contest from 2008-10, Dunigan went on to play for European clubs Hapoel Jerusalem, BC Kalev/Cramo, A.S. Junior Pallacanestro Casale and Dnipro-Azot from 2010-12. Dunigan also suited up for the Perth Wildcats in the Australia’s National Basketball League, as well as for the Seoul Samsung Thunders and Wonju Dongbu Promy of the Korean Basketball League. The slotman was also part of the Miami Heat’s 2013 Summer League team. 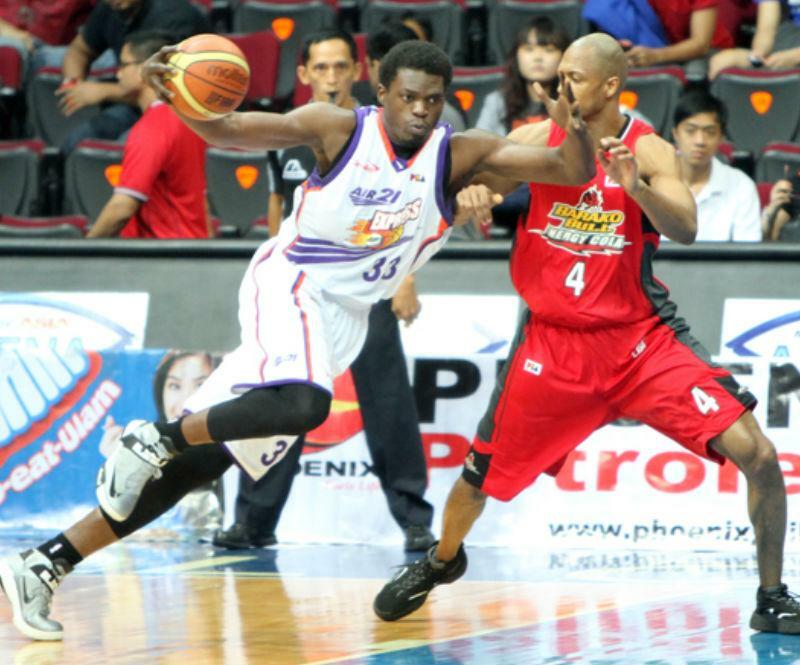 Prior to joining the Gin Kings, Dunigan saw action for the Canton Charge in the NBA D-League which also had Filipino-American guard Stephen Holt in its roster. In 14 matches for the Charge, Dunigan registered 12.7 points, 7.9 rebounds, 1.4 assists and 1.4 blocks a night. Unable to re-acquire the services of last season’s import Wayne Chism due to contract matters with his Israeli pro team, Rain or Shine opted instead to tab former Syracuse Orangeman Rick Jackson. Described by Orangehoops.org as “a solid rebounder with a nice shooting touch near the basket,” the 6’9” Jackson averaged 8.8 points, 6.6 rebounds, 1.8 swats and 1.4 assists in 141 career games for Syracuse spanning four seasons from 2007-11. In his senior year, Jackson netted 13.1 points and grabbed 10.3 rebounds while rejecting 2.45 attempts and stealing the rock 1.34 times in 35 outings for the Orangemen. Because of this feat, Jackson was recognized as the Big East Defensive Player of the Year and was also part of the All Big East Second Team. After exhausting his varsity eligibility, Jackson went on to play for French ballclub Chorale Roanne Basket after going undrafted in the 2011 NBA Draft. He would later suit up for the Austin Toros in the NBA D-League’s 2012-13 season. Jackson averaged 10.8 points, 9.9 rebounds and 1.3 blocks in 48 appearances for the Toros. Other European teams which Jackson suited up for include Hapoel Gilboa Galil of Israel and Russia’s Krasny Oktyabr. During his prep days, Jackson was selected to the USA Under-18 squad that participated in the 2006 edition of the Albert Schweitzer Tournament, a biennial international hoops meet held in Germany. The slotman was Team USA’s top player in the tourney, averaging 17.3 points, 9.6 rebounds and 1.5 blocks per game.